Other services: tour across the island for 1 hour. – 12 €, bicycle rent for one day – 15 €. When booking the entire homestead – free sauna, guests are treated with fish soup. 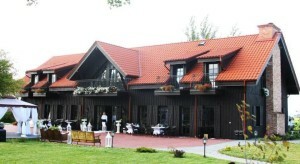 The homestead is found on the bank of the River Pakalnė in Rusnė. We are waiting for everyone who wants to get acquainted with the island of Rusnė and to go fishing and swimming in a boat or canoe. We organize excursions by boat and raft. Also, in our homestead you will find 30 seats banquet hall (with dishes, coffee, tea and sugar), a fireplace and sauna (cold water tub, brooms and towels), a summerhouse for 20 people with a fireplace and a place to build a tent. Boat trips are organized to Nida and around the island of Rusnė. Provision of transport services is provided. Homestead is near Vorusnė and Pakalnė rivers. It is a quiet place to relax. There is a spacious garden and lots of flowers. Guests can have breakfast in the garden of apple trees. This is a true paradise for fisherman and birdwatchers. We also organize boat trips to the Curonian Spit. This cozy homestead is near the Pakalnė river. It is balanced for families and small groups of people who like quiet rest. There is a summerhouse with fireplace. This homestead is located in the island of Rusnė, 3,3 km from the bridge of Rusnė near Atmata river. It has Wi-Fi, offers boating, fishing, entertainment boats and excursions. Also there is a canoe, 2 bicycles and 12 seats sauna. Other service: sauna, extreme training, trips. Lots of places for tents. Equipped with 4 fireplaces, football field, volleyball and basketball courts, children’s game area. Bikes, canoes, rowing boats, motorboats can be rented. During the winter fishing is organized on the ice of Curonian Spit. Fishers are carried with quad bikes. This homestead also offers Japanese hot tubs and sauna. There is a chance for boating, canoeing, bicycling, sightseeing of Rusnė with jeep. Guests with pets are welcomed. 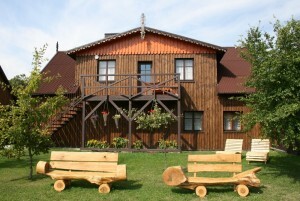 Other services: sauna, banquet hall, canoening, camping, boating. Ship for 12 people for 1 day – 180 €, 1 hour – 35 €. During the trip, you are going to be treated with fish soup. Other services: sauna, kayaking, excursions, caters. Other services: volleyball and basketball courts, swimming, sauna, summerhouse with fireplace, outside fireplaces, bicycles, boat rental. Organized fishing. 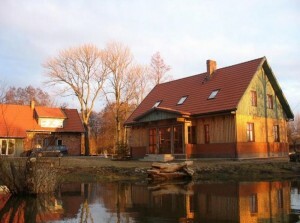 Homestead is located between two rivers full of fish – Vorusnė and Pakalnė, on the bank of Vorusnė river. 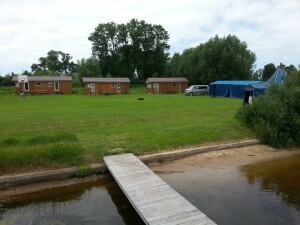 It has four houses with all amenities, perfectly designed for relaxing holiday and fishing. It is also equipped for those seeking ways to spend time actively: it has volleyball, basketball courts, swing. You can also find sauna, summerhouse, bicycles and 4 high-speed boats for the excursions around island of Rusnė, Nida, Juodkrantė, Mingė, Kintai. During the winter, fishing on the Curonian Spit is organized. Other services: ballroom-conference room, meals-snacks, bicycles, kayaks, boat, motorboat. 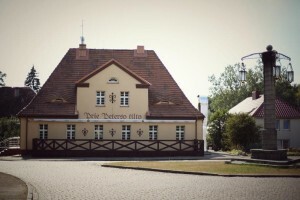 Villa is located in the city of Rusnė, in old post office, next to the Atmata river and reconstructed pier. The building is refurbished and adapted for modern needs, It features unique rooms, interiors and solutions. There is a breathtaking view of nature. We offer single and double rooms, including separate exit to the glassed terrace. Each room has a refrigerator, a shower or bathroom, internet. For your convenience, villa has mini kitchen with refrigerator, a separate bathroom, living room with fireplace, TV and internet. Other services: weddings, anniversaries, birthdays, tasting dinners, various celebrations, banquets, conference room, meals-snacks. Most of the bedrooms have balconies with the view of flowing river. Among them there are 5 en-suite style rooms with private baths and corridors. One of them, designed specifically for just married couples, is equipped with very comfortable double bed and a cozy balcony,. All rooms are designed to meet your highest expectations and comfort requirements. There will be enough space for you and your guests. Nemunas delta Regional Park is full of fascinating observation stations, pedestrian and bicycle paths. We suggest to visit Evangelical Lutheran Church of Rusnė. We offer trips by ships. There is a pier next to the villa, so if you will swim through, we would be happy to invite you in for lunch or dinner. Of course, during the warm season you can always enjoy swimming around or fishing.